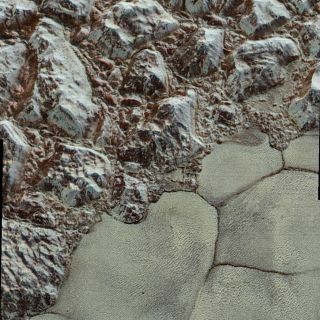 A new colorized image of Pluto, built from photos taken by the New Horizons spacecraft during its July flyby, depicts a strip 50 miles (80 kilometers) wide split between the dwarf planet's al-Idrisi mountains and the flat Sputnik Planum. Once thought to be a planet, Pluto is now recognized as a dwarf planet due to its mass and inability to sweep its neighborhood clean. While most objects in the solar system orbit the sun on essentially the same plane, Pluto's orbit takes it outside of the traditional range. Along with its largest moon, Charon, Pluto also is part of the only binary planet group in the solar system. These significant differences mean that the dwarf planet formed a little bit differently from the larger planets in the solar system. With the formation of the sun, the remaining material began to clump up. Small particles drew together, bound by the force of gravity, into larger particles. The solar wind swept away lighter elements, such as hydrogen and helium, from the closer regions, leaving only heavy, rocky materials to create smaller terrestrial worlds. But farther away, the solar winds had less impact on lighter elements, allowing them to coalesce into gas giants. In this way, asteroids, comets, planets, and moons were created. Pluto's rocky core would have been the first to form under this scenario. From there, gases and ices would have been pulled in gravitationally, with the core growing larger and larger. But like the other dwarf planets, Pluto failed to gather enough mass to reach the classification as a full-scale planet. Pluto is unique in the solar system because it is technically a binary planet. The center of mass for Pluto and its largest moon, Charon, lies outside of the interior of the once-ninth planet. This means the icy pair could provide insight into not only binary planets, but also how planets form in systems with two or more stars. "In terms of the dynamics of how planets form around binary star systems, Pluto is the closest example we have," Scott Kenyon, a theoretical astrophysicist at the Harvard-Smithsonian Center for Astrophysics (CfA), told Space.com previously. The early solar system was a cluttered place, with planets, dwarf planets, and asteroids scattered all around. As planets traveled through their paths, their significant mass gave them a great deal of gravitational power, changing the orbits of smaller bodies. Some were catapulted into the sun, while others were cast out of the solar system completely. The solar system today is clean compared to its early life. Pluto's bizarre orbit led many astronomers to conclude that it had been kicked from the orbit of the planet Neptune at some time in its history. This seemed strengthened by the planet's similarity to Neptune's largest moon, Triton. However, Pluto's orbit is such that it can never collide with the large planet, meaning that it could not have once been part of its system. Once scientists demonstrated that Pluto could not have been a part of Neptune's system, they began to search for another reason for the then-planet's bizarre behavior. Their search led them to the discovery of the Kuiper Belt, a cloud of rock and ice on the distant edge of the solar system. As a planet, Pluto stands out in terms of temperature, distance, and orbit, but as a Kuiper Belt Object, Pluto is but one of millions of chunks of rock and ice. Admittedly, Pluto is the largest known object in the region, but the dwarf planet Eris falls as a close second, and was originally thought to be larger than Pluto. Indeed, the discovery of the massive dwarf planet in 2005 led to the reclassification of Pluto as a dwarf planet rather than a full-scale planet in the solar system.